Brewery Systems | ProMinent Fluid Controls, Inc.
Breweries and Microbreweries have become a real phenomenon throughout many cities in the United States. Microbreweries have tripled their numbers between 2012 and 2017 in the US, totaling 3,812 in 2017. There are several areas that are in need of water treatment and control equipment in breweries. The largest problems arise from the wastewater treatment and boiler control. Another area of concern is the clean in place technology as well as wash downs utilizing sanitizers. The most common and easily remedied problem is the pH of the wastewater. 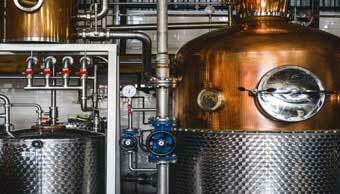 The pH can vary depending on the action that is being performed at the brewery. Both acids and caustics tend to be used and both need to be neutralized prior to discharge into a sanitary sewer. This can be easily accomplished with a single DACb controller controlling two pH points, the influent to the holding tank and the effluent to the sanitary sewer. Chemical pumps for both acid and caustic should be employed with the controller to maintain the correct pH. A probe wash may be required if the water contains a considerable amount of sludge. Polymers or flocculants may be utilized to reduce suspended solids and BOD along with filtration for the reduction of suspended solids and BOD. Boiler control is an important area that is often overlooked, however it is the workhorse for maintaining temperatures in the kettles and vats. 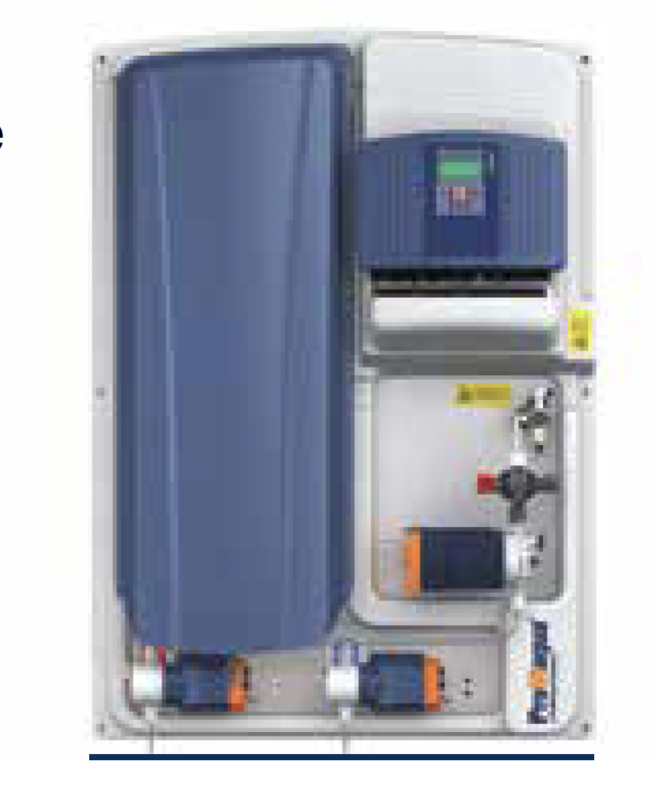 The boiler controller will help to maintain a reasonable amount of solids in the boiler to save water and to keep boiler water from contaminating steam traps and steam lines. Another problem associated with boilers is the condensate pH which is very low if not treated because the breakdown of carbonates creates carbonic acid which is entrained in the steam. If untreated, leakage can occur in the kettle’s copper jackets and piping which are very expensive to replace. Clean in place technology used for preventing biological contamination is also very important in these facilities. Kettles, kegs, piping, flooring and other associated equipment needs to be disinfected on a regular basis to prevent contamination and biological growth. 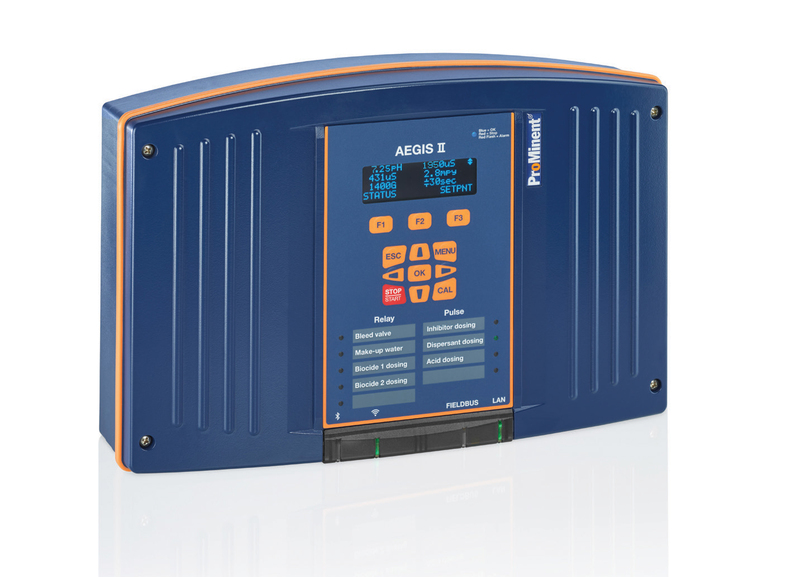 A flowmeter with a pulse or analog output to a chemical pump can meter a specific amount of disinfectant into a spray down hose or piping and kettles. 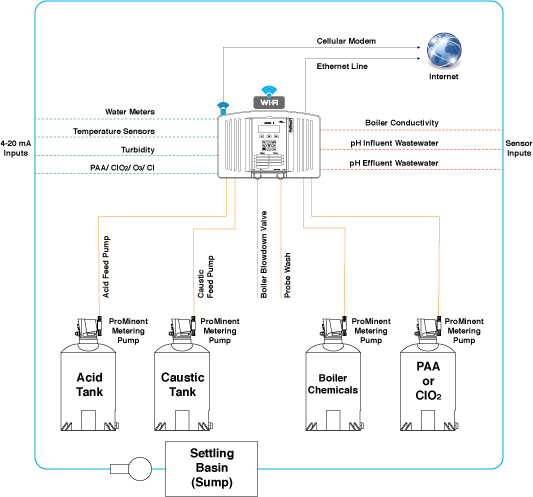 A more sophisticated method for the piping and kettles would be the use of disinfection sensors that have the capability of monitoring a particular ppm and contact time of the disinfectant and recording it. This can be accomplished utilizing a DACb or Aegis II (pictured right). By utilizing one of these controllers, data can be obtained and reports generated to comply with the best available technology in the sanitization process. You may also add devices to monitor temperature in the kettles, turbidity in the wastewater and other areas. All of these parameters can have alarms and data logs for quality control. Emails can be generated (Aegis II) to provide notification to operators so that no spoilage or mishaps occur. In short, we can provide a hub for control, data and alarm functions for a fraction of the price of a custom built system with the added benefit of ease of use, so that extra charges are not incurred when optimizing the system and changing operating parameters.